Coconut almond cream cake is a coconut lover’s dream cake, and the perfect Easter dessert recipe. Coconut cake is filled with almond cream filling, then topped with fluffy coconut cream cheese frosting! There is a short story behind this particular flavor selection. During the wedding planning, Mr. J was very involved in most of the planning and DIY projects. I think he wanted to keep tabs on my spending, (ahem, I went over budget!) or maybe he is just wonderful. 🙂 There were some projects he wasn’t too keen on, like hot gluing a card box with pink ribbon, but when it came to the cake, he was all about that. We agreed he would pick what goes on the inside and I will decide on the outside. 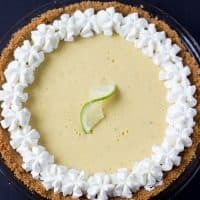 He spent days narrowing down the cake to three flavor combinations, working with the cake lady on several (unnecessary) cake testings, to get exactly what he wanted. At the end of the day, he picked his favorite combination of coconut and almond to be the top layer. As tradition calls, we will save that layer to have on our first anniversary. Simple and perfect plan! Right? On the glorious day of our wedding, one of my bridesmaids was supposed to grab the top layer of coconut almond cream cake and save it for us in her freezer until we came back from our honeymoon. But some misunderstanding went down and the cake ended up in our apartment that night, where guests from the wedding devoured it without knowing it was the couple’s cake. The next morning when we came to say goodbye to my mom before we left for our honeymoon, Mr J saw the rest of what was supposed to be our cake. I can still remember the look on his face and it is heart wrenching. Needless to say, he was very upset and only the shores of Jamaica were able to cheer him up. To be honest, I didn’t care much about having a one year old cake. I don’t even eat my own cakes after two or three days, so I can only imagine how they would taste after a year in a freezer. But tradition calls for this and he was looking forward to it. So for our first anniversary, I made him a recreation of what I imagine that coconut almond cream cake would have been. I’m glad to say this cake lived up to his expectations and it is agreed we will have it every year for our anniversary. 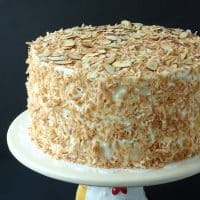 Don’t be put-off by the lengthy recipe for the coconut almond cream cake, because it is a very straightforward, and an easy cake to decorate. The resulting moist coconut cake and almond filled layers will definitely be devoured and loved by any guests you make this for. 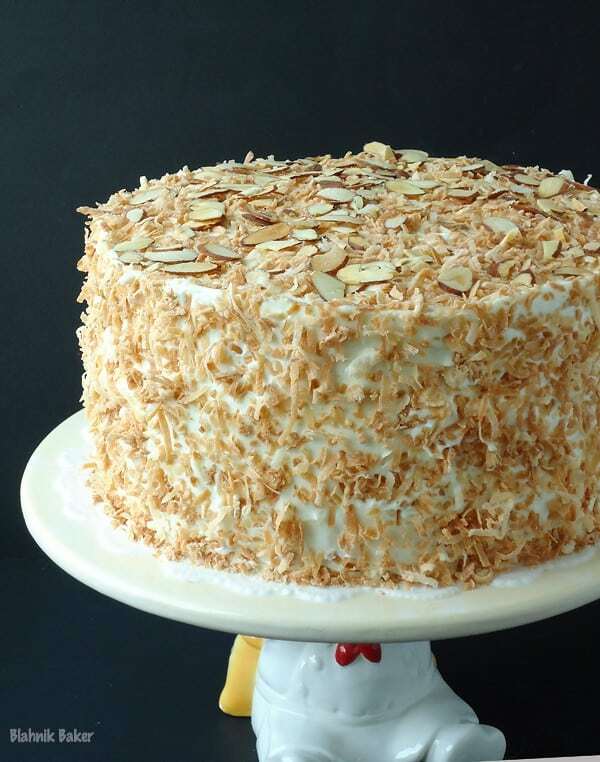 Enjoy this coconut almond cream cake recipe! Preheat oven to 325 degrees F. Grease and line 3 9-inch round cake pans with parchment and grease parchment paper. In a medium bowl, sift the flour, baking powder and salt together. Use a large measuring cup to whisk together heavy cream, coconut milk, vanilla and almond extracts. In the bowl of an electric mixer, beat the butter until creamy. Add the sugars gradually and beat until very light and fluffy on medium speed for about 8 minutes. Scrape the sides of the bowl as needed. Add the eggs, one at a time, and mixing well until combined after each addition. Stir in the liquid ingredients and mix until just combined. Using a rubber spatula, fold in the dry ingredients gently until just combined. Be careful not to over-mix. Divide the batter into the prepared pans and bake for 30 to 35 minutes or until a toothpick inserted in the center comes out clean. Let cakes cool in pans for 10 minutes before removing and cooling on wire racks. Combine cornstarch and almond extract with 2 tablespoons water and stir until cornstarch dissolves. In a medium saucepan, combine whipping cream, brown sugar and butter. Bring to a gentle boil over medium heat. Remove from heat and stir in cornstarch mixture until combined. Stir in coconut flakes, sliced almonds and sour cream. Refrigerate for up to 8 hours. In the bowl of an electric mixer, beat butter and cream cheese on medium high until completely smooth about 2-3 minutes. Reduce speed to low and add sugar, one cup at a time. Beat until combined. Add coconut milk and coconut extract and beat to combine. 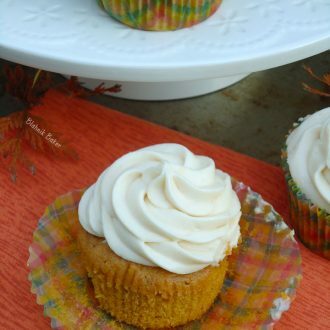 Increase speed to medium and beat frosting until smooth and fluffy. Buttercream might be too thin to spread so place in fridge for 20 minutes to an hour until firm enough. Alternatively, add more sugar and beat to thicken frosting. Preheat oven to 325 degrees F. Line two baking sheets with foil and spread out coconut flakes and almonds in a single layer on separate baking sheets. Bake until lightly browned and toasted, about 2 minutes. To assemble cake, place one layer on cake board or cake plate and top with half of chilled cream filling. Spread evenly. Place second layer (face up) on top of cream filling and press gently. Repeat these steps with the remaining filling and cake layer. (At this point, I usually wrap my cakes from top to bottom in clear plastic wrap and align the layers to make sure they are straight. If the cake is wobbly, I also refrigerate for 20 minutes before frosting). 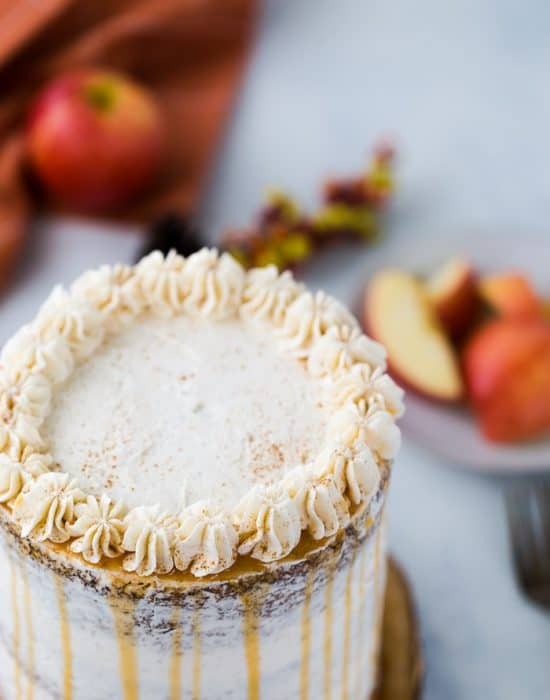 Frost cake with cream cheese frosting. Frosting does not need to be smooth. Press toasted coconut flakes on the sides and on top of the cake. Finally sprinkle the top with toasted sliced almonds. Serve at room temperature. Store refrigerated for up to two days. Coconut and almond are some of my favorite flavors, but I don’t think I’ve ever had them together. What a great combo! Love your story about choosing the wedding cake together. I think the cake tasting was my husband’s favorite part of wedding planning. And his brother/best man came with us and LOVED sampling all the cake. But I’m sorry about the mishap with your top layer. What a shame — although it sounds like you started an even better anniversary tradition! My husband and I are coming up on our first anniversary, and we’ve had the top layer of our cake (red velvet) sitting in the freezer. I’m a little worried that it won’t taste good, so I’m planning to bake a batch of red velvet cupcakes, just in case our cake didn’t hold up well. This is one beeeeeeeeeeautiful cake, my friend!!! Love coconut and almond together! My hubby LOVES a coconut cake, and I’m sure he would have been quite disappointed if it disappeared after the wedding too! We did keep our top tier and ate it a year later…it was just ok 🙂 This cake looks so yummy! Jennifer I’m glad you enjoyed your cake on the anniversary!! I’m not too sad I missed it lol! Awwww your poor hubs! That sounds heartbreaking! It looks like you def. more than made up for everything with this cake, though, it is beautiful and I’m sure SOOO delicious! Oh Kayle, he was so sad man..almost heartbreaking! But he did enjoy this cake and he is all excited to have it again next year. You always make the most beautiful cakes! That stinks that your top layer cake was eaten, but I’m sure that this one would taste even better! happy anniversary! Your cake is beautiful!! Oh man!! I’m not a big fan of coconut but I could probably make an exception for this cake!! It sounds wonderful. Also, bummer on everyone eating your anniversary cake. But I think this cake made up for it!! Really? You don’t like coconut?? I need to change that because there are so many great coconut desserts. I bet if it was hidden with chocolate you might like it…hmmmm Emily! You have a Mr. J too! How fun! I just made coconut cake and debated and debated about toasting the coconut. Mine came out delicious but I love the look of yours with the toasted goodness! Now that’s what I call a cake! 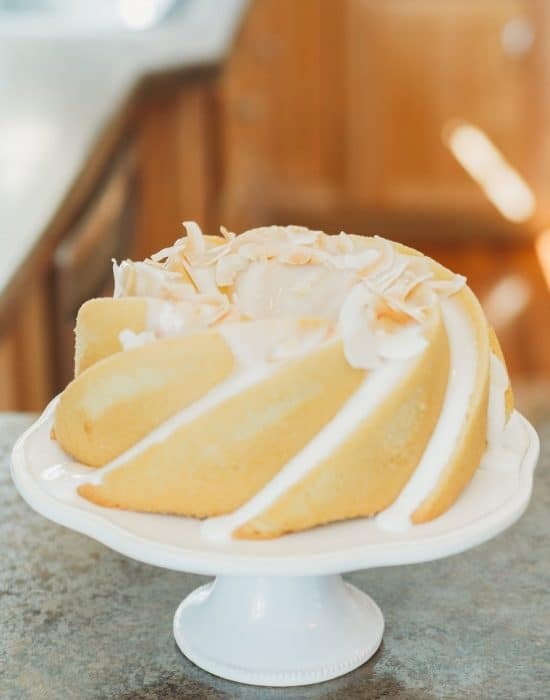 I’m crazy for coconut, so I’d be head over heels for this cake! Your husband knows his flavor combos! That is too bad about the cake . . . though I have to agree with you; year old cake? I’ll take this one! 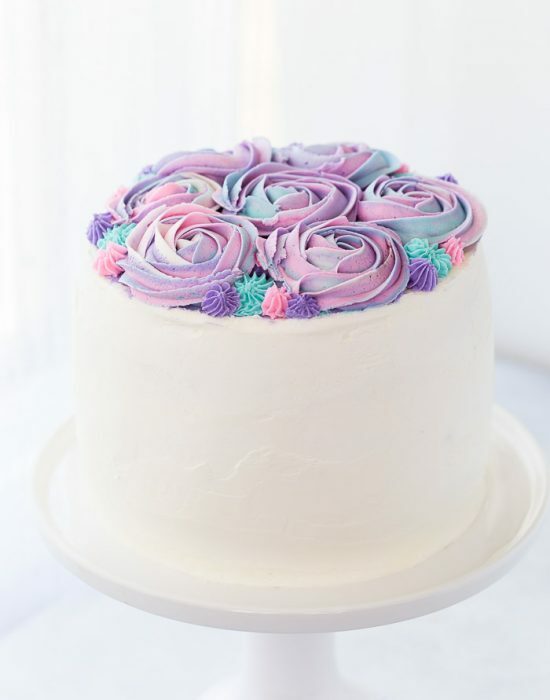 Its layers and frosting are absolutely stunning! That’s so sad about the cake, but it’s absolutely adorable that you replicated it! Sweet in more ways than one 🙂 And your husband does have exquisite taste! Almond and coconut sound delicious! Thanks Dru for leaving a comment and letting me discover your blog. I love it :). And yes, Mr J likes to think he has great taste! What a sweet story this turned out to be! But, I still feel bad for your hubby. Hopefully, you made up for it with this beautiful cake you especially made to mark the occasion…with his favorite flavors! Once again…happy anniversary! Stacy thank you so much!! You are too kind. He was very happy with the cake and I think the new tradition makes up for it! What a beautiful cake!!! The coconut-almond flavor match up is amazing! Aww, what a sweet thing to do, Zainab! And what a wonderful cake! I pinned this to one of my large group boards. 🙂 Hope you are having a great week, Zainab! Julie you are the best!! Thanks for sharing on Pinterest :). Have a great weekend coming up! I’ll catch you soon on chat to catch up. Just so you know – I want this for my birthday. 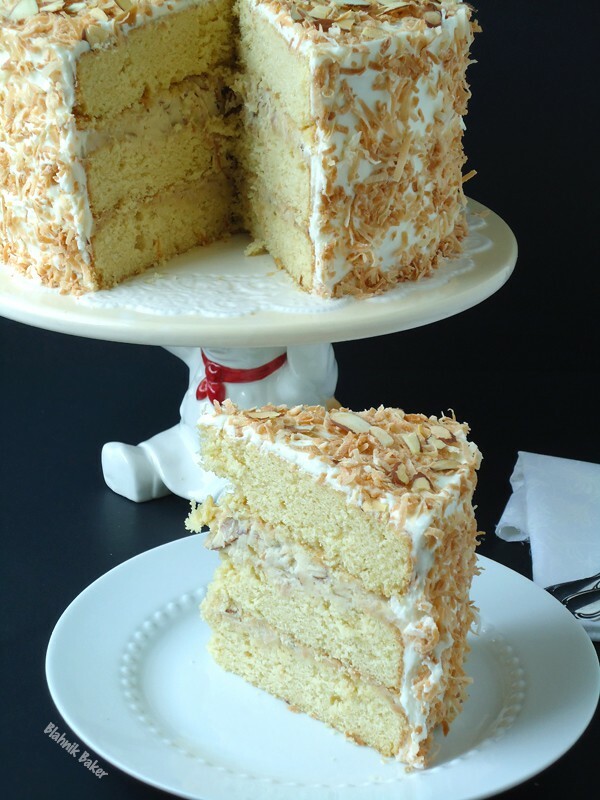 pretty please…..
Coconut cake is my favorite! OMG it is sooooo yummy! I don’t know how cakes taste after a year in the freezer, but I do know that they are still awesome, sometimes even better after 6 months in the freezer. Oh my, this is such a beautiful cake! 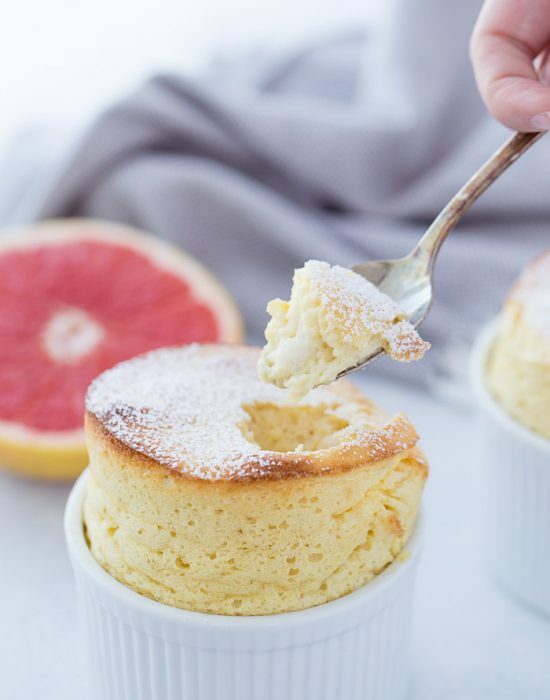 My husband loves anything with coconut so thank you very much for this recipe! Thanks Samantha. I love that we have a new tradition too…no one wants a year old cake indeed lol! Coconut and almond are two of my favorite things in any order. That cake looks so moist…my mouth watered the entire time reading the post. How thoughtful of you to recreate that cake for your husband. Very nice! Happy Anniversary. Your thoughtfulness is a gateway to seeing many more. Keep it up! And oh no about the cake! But I am with you…I don’t know how I feel about eating year old cake! Love how you have a new tradition that you are going to make this each anniversary!! What a BEAUTIFUL looking cake!!! 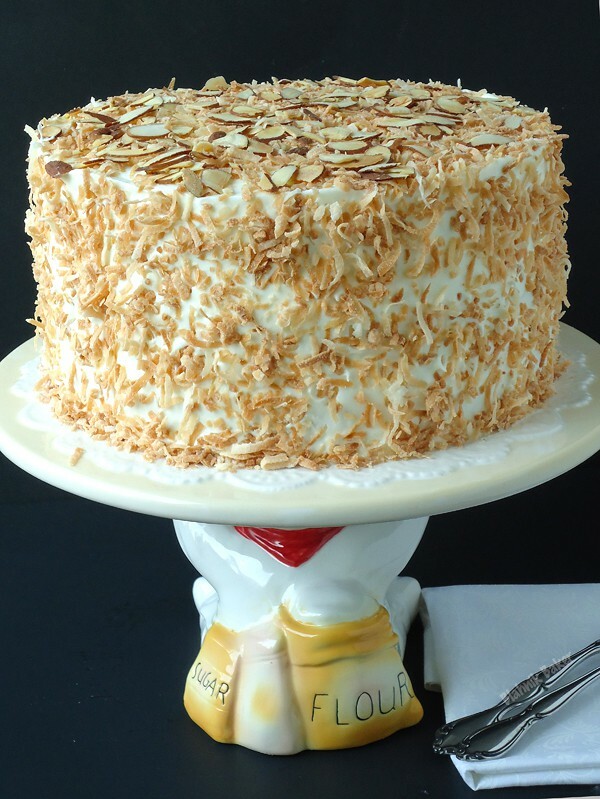 I love both coconut and almonds, and your cake looks so rich and so moist!! Looks absolutely mouth-watering!!! What a great cake to celebrate your anniversary!! Thanks for linking up with What’s Cookin’ Wednesday! Coconut and almond, two of my favorites! 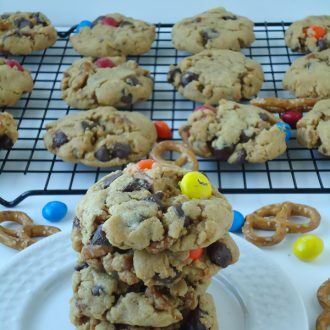 I had to pin this to put on my “to bake” list. I dropped in from Paula’s Marvelous Mondays Party. Have a great week. This cake looks fantastic! Thanks for linking it up to MM this week! You didn’t miss anything. Year old, freezer burnt cake that taste like cardboard is not tasty! Thank you so much for joining us and sharing at Best of the Weekend! Pinning to our party board, and we hope to see you again on Friday. I’m just loving the coconut and almond combo since I looooove both. My wedding anniversary is coming soon and I’m going to recreate this. Quick question about the recipe, u stated 1 cup of butter or 3 sticks of butter. Pls reconfirm, I thought 1 cup of butter is 2 sticks of butter. Thank u.
Hi! It is 1 1/2 cups of butter which is 3 sticks. Sorry about the typo there. I hope you are able to try this!! I love the sound of this but also want to know about the butter. Three sticks is 1-1/2 cups of butter. Please let us know quickly! I want to make this in two days for our Easter dinner!!! Thanks! Hi Diana, a stick of butter is usually 1/2 cup in the US and that is why I said 3 sticks since you need 1 1/2 cups of butter. I hope that helps! May I know when am I supposed to add the 1 cup whipping cream in making the cake batter? Is it supposed to be mixed with all liquid ingredients? Hi! Yes, the cream goes in with the rest of the liquid ingredients. I hope you enjoy this cake! Baking is my cooking weakness but I printed this one out. It looks yummy. This cake was delicious!! I only made one change – I didn’t put almond extract in the cake because I wanted a little bit more contrast in favors between cake and frosting. It was soo good, although it probably would have been great with the almond extract. This is an extremely heavy cake though – keep slices small! I just made this cake with a friend and it is far and away the best cake recipe that I have come across. The flavor and texture are delicious! Thanks for sharing this delicious treat, Zainab.